Dubai, United Arab Emirates, 22nd December 2018: Global trade enabler DP World has helped establish a 2,500 km long transport corridor from Jebel Ali to the Naseeb-Jaber border crossing between Jordan and Syria. Trucks loaded with goods at its flagship Jebel Ali Port and Free Zone in the UAE have travelled through Saudi Arabia, Jordan, Syria and Lebanon in close collaboration with all customs authorities and customers. The Naseeb-Jaber crossing was once one of the busiest checkpoints on the Damascus-Amman international highway and is the main crossing for Syrian exports to Jordan and Gulf countries. The first convoy of three Dubai-registered trucks set off from Jafza loaded with dry and reefer cargo from Green Cedar Company, DP World’s partner in the transnational humanitarian operation and a Jafza-based logistics provider. Their transit time of six days was just a fourth of the 24 days it used to take during the height of the political conflict that had shut down the border. On their return leg the trucks brought back fruits and vegetables to Dubai. As many as 350 commercial trucks carrying electronics, detergent, chocolate, other foodstuffs and cars used to enter Syria and pass through to other countries daily before the closer of the border in the last three years. The Naseeb border is the lifeline of the Jordanian economy as 70 per cent of its imports and exports pass through Syria under normal circumstances. The closing of the border in 2015 dealt a severe blow to the Jordanian economy, with the loss to Jordan’s logistics and transport sector alone estimated at around half a billion US dollars. Jordanian businesses also prefer the land route since exporting goods through the Naseeb crossing is three times cheaper than exporting through the Gulf of Aqaba. 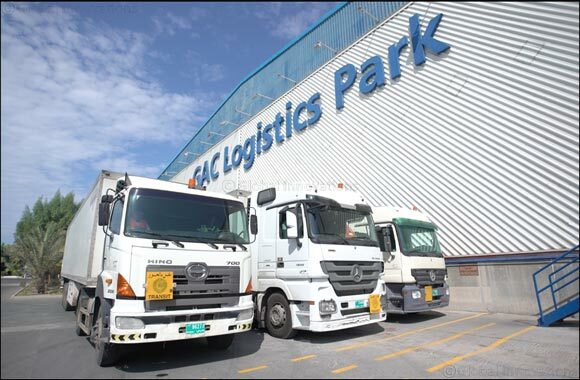 Connecting Lebanon to this focussed and purposeful supply chain route was highly significant because its trade with the GCC region had suffered due to the regional upheavals in recent years. Lebanon’s trade deficit widened in the first 6 months of the year to reach $8.04B, compared to $7.94B, during the same period in 2017. Lebanese exports to Gulf markets decreased by half since the Naseeb crossing was closed by rebels in 2015.